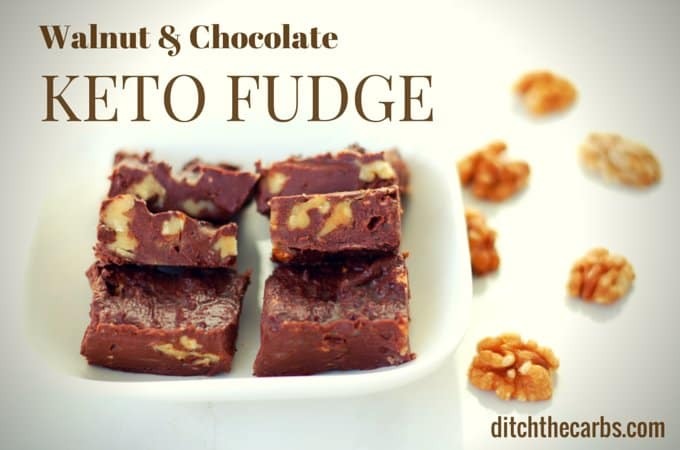 Simply the best and easiest chocolate walnut keto fudge you will ever find. Even my 8 year old whips this up. He has also on occasion omitted the walnuts and added peppermint flavouring instead – genius boy! 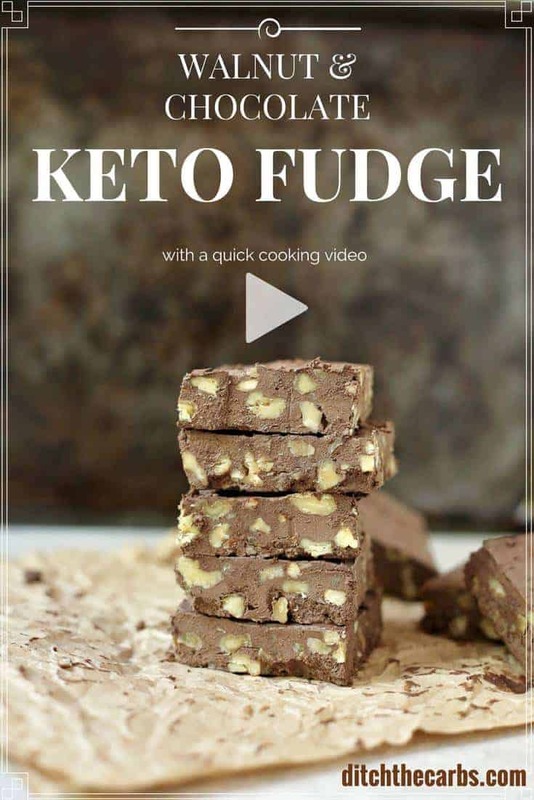 Now with a new cooking video so you can see for yourself how easy it is to make chocolate and walnut keto fudge. I know we are trying to give up the sweet taste and sweet foods, but every now and again we crave something and I’d rather have a sugar free version at hand than a high carb alternative. These chocolate and walnut keto fudge squares are really quick to make and incredibly simple. Also for some people starting out, having a low carb sweet treat may be just the thing to get them started, or get them interested. They take only 10 minutes to prepare, then pop them in the fridge to set (or heaven forbid you eat some of the mixture as soon as it is made 😉 ). I added walnuts because it seems that is the number one addition you guys add to my chocolate mint truffles and my nut free keto brownie, so I thought a walnut fudge recipe was required here. What flavour would you like me to develop next? Leave a comment at the end of the post. UPDATE – it appears some people are making this with spreadable, or tub, cream cheese and it is not setting. 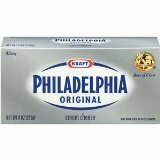 You must use the regular Philadelphia cream cheese in a block for the best results. Another tip, to speed up the fudge to set, pop it in the freezer then you have a quick frozen treat/dessert. Remember when making walnut keto fudge to not over heat the butter or cream cheese. they just need to be soft enough to mix together. if you do accidentally overheat, place them back in the fridge until semi soft again. Mix the softened butter and the softened cream cheese until there are no lumps. Add the cocoa, sweetener and vanilla. Mix thoroughly. Add the walnuts and gently mix. Place into a lined dish, or plate. Put in the fridge to set. Definitely not sweet enough for me. I tried doubling the amount of sweetener and it didn’t help. Then it was granular, still not sweet enough, and had a weird aftertaste ( I used Swerve granular). I wonder if powdered sweetener would work better. The amount of sweetener to use is the most difficult aspect to get right at the beginning. We are all on different parts of our sugar-free journey and so one person’s sweet tooth will be completely different from another. I always say in my recipes “or more to your taste”. If you are starting out, you may require possibly double the sweetener I use, and as time goes on, you will require less and less. I had the same experience, but had to quadruple the Swerve and still not sweet! Was starting to wonder if I was the only one. I made these as a Christmas present for my keto daughter. I didn’t find them chocolatey enough, so I added 3 oz. of melted bittersweet chocolate. She loves roasted macadamia nuts, so I used those instead of walnuts. I suspect a little instant espresso coffee powder would also add some intensity. A tasty solution for those fudge cravings! I added extra cocoa and pecans because I was low on walnuts. Very creamy. I am so angry with you!! This recipe wasted my time and ingredients that are not inexpensive! !I will never try any of your recipes again!! So make up your own recipes; these are free recipes that the authors could charge for, your response is unnecessary and extremely rude. This recipe worked beautifully for me, you probably made a mistake or didn’t buy the right cream cheese, regardless there’s no need to act hostile. Being rude is uncalled for!! Move on! I am so thankful for the free recipes. I find that you must follow most exactly . I did one once and the butter was to be softened and mine had started to melt and caused problems in the recipe. Apparently this recipe has worked for several people. I’m going to try it! Sometimes different sugars affect recipes. I use coconut palm sugar. I know it’s not as low carb but for me in baking it works and tastes better. What sweetners have others used? I followed the directions exactly. I now know why some refer to these as “fat bombs”. It tasted like you were eating a stick of butter, the only part I liked were the walnuts! I don’t know how these are called fudge when there is no dairy in them. Will not be making them again. On to test my next recipe, zucchini blueberry loaf. Do I need to use an electric hand mixer for this fudge? Can you double this fudge recipe? Thank you! All my recipes, you can select how many servings you wish to make, then the recipe magically calculates the ingredient list and quantities for you – ye ha! I made this fudge exactly as indicated in the recipe. It is delicious! I eat a traditional diet, and never use anything but real sugar, but wanted to make a treat for my mother-in-law, who is low-carb, low-sugar. Now I don’t want to give it away–will have to make more. I think this is a very good recipe. Worked out great. Kids loved them, husband loved them. I can’t wait to make other versions using different flavoring or nuts. Thanks! I just made this recipe using Stevia and thought it was good, rich fat bomb. Been mostly keto for a few months and am not looking for anything on the sweet side. I liken it more to a truffle than fudge and is a good base recipe. Will make it again and might tweak it a bit by adding almond or walnut extract or essential oil drops. Yes you can get the full fat cream cheese in the UK, many of my readers in my low carb support group tell me they can buy it in Tesco and Sainsbury’s. I live in the UK and buy Duchy Organic Cream Cheese from Ocado,, which is cheaper and nicer than Philadelphia, and works out well in all the ditch the carbs recipe I’ve made so far 🙂 (including cheesecake and the keto brownies). Awesome tip, thank you Rosa. same thing happened to me and besides that turned out like cement..
Hello, I am new to this and am just starting a sugar free, no/low carb journey. Would this be a good way to bridge my family and I from eating sugar to not? Any tips would be great. Thank you. This is a nice sweet treat for your family, but luckily without the sugar. In the long run, we want to reduce our number of sweet treats, to help us lose our sweet tooth, but it is good to have low-carb and sugar-free recipes on hand when a sweet craving calls. Eventually you will require sweet treats less and less, and you will require less sweetener for recipes as time goes on. Good luck with your journey to become sugar free. You’ll be amazed at how incredible you feel. I’m sorry, I can’t remember the size of pan I used. As for the sweetener, I always advise that you add sweetener to your taste. Did you use a 1:1 sugar replacement or more concentrated formula such as Stevia powder? You may wish to read this article on my Ultimate Guide To Low-Carb Sweeteners that explains what they use in what I avoid. I add the minimum sweetener that I can, but for those just starting out, you may require a lot more than the recipe states, and for those who have been sugar free for some time, may require a lot less. I made it and it is not sweet. Added more sweetner and it still was not sweet. Easy to make, no mess fat bombs. I am looking for keto desserts ideas that my whole family will love! This one looks perfect to me. I will try to make 2 batches one with walnuts and one with hazelnuts! Hi there! Just wondering how you would store it? Leave it in the fridge? Thinking of making it and giving as a Christmas gift. It needs to be kept in the fridge so the full fat cream cheese and butter remain solid. What a lucky friend to receive such a kind gift. Love this recipe! It is very easy to make for a yummy occasional treat, and really great to make when you want to “share” something with visitors who are not following a HFLC way of eating… as they also love it! OHMIGOSH, Libby, these were SO GOOD! And easy. Definitely will be making again. Thanks! Yuck! Sorry but these were not good. They are nothing like fudge. It basically tasted like chocolate cream cheese. My sister in law (who’s also Keto) didn’t think they were great either and would describe it as mousse. Made this tonight. Not only was it super easy, but it was incredibly delicious! It definitely fullfilled my craving for something sweet. Thanks for the recipe! Did you use 4 oz of cream cheese or 8oz? I ask because 4 oz is half a block of cream cheese like the recipe lists but the video shows a whole block. I made these and mine turned out not so good following the written recipe & I’m trying to figure out what I did wrong. All the other recipes I’ve had great success (read as utterly DELICIOUS!) and I was kinda wanting some fudge. :-D. Thank you for sharing all your recipes and knowledge. I’m a big fan. The butter and cream cheese should be equal quantities i.e. : 4 oz of each. The cream cheese as I mention in the post MUST be full fat. The spreadable variant will not set. You also need to adjust the sweetness to your own taste. You may require more or less than me who has been sugar free for some years now. Thank you! I used full fat ingedients. I’ve been low carb for 12 weeks and have lost 30 lbs & feel great. I’m working very hard to make this my way of eating instead of a diet. I will try the recipe again. It was still tasty. The consistency was just a bit off. Thanks again for all the great recipes and info you share. It has helped me a lot and inspired me to try a few ‘recipes’ of my own creation. Nice work April, what a result! Any ideas for white chocolate? 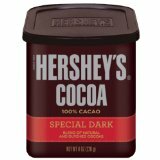 Has anyone tried using melted unsweetened baking chocolate instead of cocoa powder? How much did you use? I’m thinking the cocoa butter in the chocolate would help it set and also add to the texture. I couldn’t find dark cocoa poweder, so I used the regular. It definitely doesn’t have the dark fudgy look as in the picture. I had to use the hand mixer for a good 20 mi nutes to get the granulated Serve to “melt” into the mixture so that it wasn’t grainy. I added 1additional tablespoon of Swerve, and 5 packets of Pure Via stevia powder. After mixing it had the consistency of chocolate butter cream frosting, and I think it really could be used for that. If you’re not doing low carb, you could use powdered sugar and make really good butter cream. I hated mine…I used Splenda and it tasted sooooo “diety” I couldn’t eat it… I’ve been using Splenda for years… Why would it not wok in this receipt? Any thoughts….help….I’m just starting my journey. 120g = 4.2oz weight equivalent. 1 stick of butter is approximately 110g. I could only get the powdered Swerve instead of the granular. Guessing the measurements would stay the sam regardless? Thanks so much hope! Hi I accidentally used regular cocoa powder, not dark cocoa. How badly does that affect the recipe as far as low carb, low sugar? You would have to check the brand you used for the carb content, each brand will vary enormously. Hi Libby!! Thank you for sharing all these great recipes for us who are just getting started on LCHF. The second time around, I lowered the amount of walnuts and added shredded coconut. It was delicious!! Finally a fat bomb not made with coconut oil. Yes! It was delicious. I rolled it into a log in glad wrap and popped it in the freezer (like I would with a flavoured butter). Can now slice off a bit, it warms in no time and craving fixed. Bit scared to look at the rest of your recipes though – I may never leave the kitchen again! Are these spreadable enough to pour into silicon molds to make fat bombs? Maybe add the walnuts after they go into the mold? We played around with your keto fudge recipe until we got a single serving we liked. That way my five children could each make a different concoction to their taste. We came up with this: 1 Tbsp cream cheese, 1 Tbsp butter, 2tsp cocoa (unsweetened), 2 tsp sweetener, 1 dash vanilla. Nuts, mint, etc optional. It works perfectly. Not only do they get to customize, it makes a small enough amount so as not to over do it. THEN my 11 year old son asked if he could try to modify it again to make a brownie. I let him experiment. Wow. What we came up with we named “dirt” because it doesn’t hold together like a brownie, but tastes unbelievable. He asked me to share his creation with you… 1 Tbsp cream cheese, 1 Tbsp butter– melt. Then add 2 tsp cocoa (unsweetened), 2 tsp sweetener, 2 tsp almond flour, 1 dash vanilla. Mix well, then microwave 30 sec – 1 min. It is so simple. We tried adding an egg but made it more cake like. Without the egg it looks like dirt, hence the name. Thanks for all you do. This is so cool! I am so going to give this recipe to my children to make for themselves. I absolutely love kids playing around with ingredients and recipes in the kitchen. He is a little master chef in the making. Please thank him for sending me the recipe for “dirt”. I absolutely love it. Can you use real sugar instead of artificial sweeteners? Yes you can use sugar but just remember cane sugar, stevia or erythritol are all natural, and all processed but stevia and erythritol won’t raise your blood sugars, cravings, fat storage etc. It’s a personal choice but the recipe will no longer be sugar-free or low-carb. It will be high sugar, high fat. I typed these ingredients into my fitness pal and my nutritional facts are completely different. Mine says it’s 88cal, 5.7g carbs. What in the world?? Do you use a different app to track? If so, what do you use? I don’t track anything any more – such a relief. You eventually begin to know what to eat and what to avoid. If I were to use an app, I would use Keto Diet App . I use cronometer.com to calculate all my nutrition panels here. It’s the most accurate I have seen. AhhhhhhhhhMAZING!!!!! Thank you for sharing! ONLY thing I’ll change next time is the amount of truvia (only 1 tbs). Just tried this. Great way to fill some fat in. Thanks! What size pan do you use? I am unable to find any mention of a pan size. I appreciate your help with this. Gosh i can’t remember. Just big enough so that it would spread out to be about an inch thick. I used an imusa silicon ice cube tray .. spread it on and popped it in the freezer .. perfect little craving buster fat bombs! I made it with some granulated stevia but I can’t eat it – it leaves this really cold feeling in my throats and stomach for ages after and I feel ill! So I tried again with butter, marscapone, vanilla and melted 85% cocoa chocolate. Plus I added toasted dedicated coconut and toasted hazelnuts. This time it is pretty delicious. Hopefully still low carb enough, not sure?? I’m new to low carb fat bombs… it is quite buttery but I love butter so it’s ok (hence why lchf is the diet for me). And I used salted butter because it adds something to the taste, I think..
Granulated stevia is rarely 100% stevia…most brands are mainly erythritol, despite their names (read the labels though). Erythritol is known for leaving that cooling sensation. I don’t mind it, but I definitely notice. Other recipes have suggested a mix of erythritol and xylitol, almost 1:1 with a little powdered (pure) stevia added, as apparently this minimizes the cooling effect. I’ve got mine mixed, just haven’t used it yet. Also, be aware that xylitol is poisonous to dogs…don’t share!. ‘Serves 12’ is very misleading. It assumes that we’re willing to share! I think not 😛 you’ve also omitted the very crucial Step 6: Lick the entire bowl! This is everything I’ve been looking for in a low carb dessert and it’s so simple. Thank you for sharing! These would be awesome with a firm log of chèvre (fresh goat cheese) instead of cream cheese, or maybe half and half. Goat cheese chocolate truffles are divine. Would it be great with Mascarpone as well? This sounds great and I’m going to try it tonight. I wonder if you’ve tried a cinnamon version? My mom makes an amazing cinnamon fudge and I’d love to see it keto-fied!! Oooh, cinnamon sounds incredible. I’ll have to try and see if I can make something similar. I love to add cinnamon to recipes that call for cocoa powder! Hi I made this last night couldn’t get it to set, I can’t get block cream cheese over here it is all spreadable and in tubs is there anything I can do to make it taste fudge like instead of just chocolate flavour cream cheese? You definitely need the full fat regular block of cream cheese. It is available in the UK, I remember buying it there. And it is available on Amazon too. You can use the regular spreadable cream cheese, but to make it set you have to freeze it, then it would be an amazing frozen fudge. If it tastes like chocolate cream cheese, add some extra cocoa, sweetener and maybe vanilla and a tiny pinch of salt (that brings out the cocoa flavour). There is this recipe for chocolate mint truffles which you could use. I use 70% melted chocolate in them but you could use 90% instead. It may be a bit bitter without any sweetener but that is the beauty of adapting recipes to our own sweet tooth (or lack of) as we are all on different pars of our sugar free journey. Those of us who have been sugar free for some time will require less sweetness than those who are just starting out. Always adjust to your own taste, then you know it will be perfect. Enjoy. Wow. I just made this and it is so bitter I can’t even eat it. Not sure what I did wrong I did the cocoa, butter, cream cheese, stevia, and vanilla. I used real butter instead of margarine is that it???? I would never use margarine (I threw that in the bin years ago). My guess is either too much stevia was used (it can be bitter if used in excess and in it’s pure form) or not enough, so the bitter cocoa taste comes through. I always adjust the sweetener to taste. I also use salted butter and it works every time. Sorry to hear this. Thank you. I did not know that using too much stevia could cause bitterness. I too got a bitter taste. Not as sweet of chocolate that I was dreaming of. Also not as dark either. I just made these for a second time and my son couldn’t wait to lick the bowl! Flawless recipe though I did substitute half of the sweeter with powdered erythritol. I think I am going to try it with coconut butter (instead of butter) and some toasted coconut or almonds. My F-I-L would tell me to leave it alone, “If it ain’t broke, don’t fix it!” (You need to read that in a crotchety old man voice) Thanks again for giving me an amazing answer to my craving with ingredients I have on hand. Your hard work is much appreciated! What an excellent recipe! This really hit the spot when I had a sweet craving. Just a little bit satisfied the craving. I did not have walnuts, so I didn’t use them. I used regular baking cocoa because that’s what I had on hand. Everything was smooth, silky perfection! This is a wonderful base recipe. It would be nice to add a little pb or maybe almond and coconut extract. I used swerve as the sweetener. This will be my new go to recipe for a low carb dessert. Thank you so much for sharing this recipe! Thank you Emily, what a lovely review to leave. I’ve used this recipe for months to make my fat bombs. I do finely grind the walnuts or pecans for the bombs. I’ve never had this to fail. But using less Swerve now, since I’m losing that sweet tooth. I always have a bag of these bombs in the freezer. Love your web site for recipes and information. Made this last night, and I so wanted it to taste good. My mistake was not using dark cocoa.I used the correct amounts of butter and cream cheese, however it tastes way too buttery! I’m not a quitter, though! I’ll attempt it again with good, dark cocoa powder. Thank you for this recipe! I’ll get it right!! I have read all of the comments and am dumbfounded at how this recipe can be screw up. I can’t even cook and it came out perfect. I followed the directions to a tee except I used Splenda as my sweetener (Don’t fuss at me, I can’t take the bitterness of stevia, haha) along with a couple tablespoons of full fat cream. If I had one complaint, it would be that is this is soooo good, I wanted to eat every bite of it all at once, hence blowing my carb count for the day. I actually prefer this to real fudge for a couple of reasons. Real fudge is so rich, you can only eat a little bit without feeling a bit nauseated and secondly, this has the flavor of a decadent chocolate cheesecake. Win win. If you are wanting to try a really good Keto dessert, don’t listen to those earlier complainers. This is not hard and it is delicious. Try it!! Kudos to you for a great Recipe. Sorry I just saw that you use Hershey’s cocoa. But still wondering if I can use cacao instead as it’s what I have at home? Sure, any good dark unsweetened cocoa powder is great. Just not the drinking chocolate cocoa which some readers have tried. Your ingredients listing for the recipe says cacoa but your pantry items list cacao, which is best? I thought cacao was raw chocolate so I am wondering if it will be too bitter if I use that instead of cocoa? Maybe that’s why some people have having a bitter prob with their attempts at this recipe? Or is niether here nor there? I made this and it is amazing!! I doubled it, mixed all ingredients cold, used a stevia/erythritol powder and it couldn’t be better! Thank you! I’ve just started a LCHF diet and am delighted to see that I can still have some dessert. In fact, this recipe may be almost too good. It won’t be easy to keep to,the little piece I know I should have. I made it with unsalted butter and regular cream cheese, letting them soften at room temperature. I used an electric hand mixer to beat up the ingredients. I used 2T of Truvia. Worked perfectly. One tiny quibble, they’re a little too buttery/greasy for me. (I don’t like buttercream frosting, either.) How do you think the recipe would work if I used a 2:1 ratio of cream cheese to butter, so 160 g cream cheese and 80 g butter? Thanks. I’m sure that would work out really well. I love readers to experiment and adapt my recipes, it’s all about being back in the kitchen and loving to cook. Go for it. I have to admit I feel the same way. I dont want to use more cream cheese either are there any other ingredients such as a little bit of heavy cream or ground up nut flour? I just cant see myself using these as fat bombs unless they are chewy as opposed to slimy. Have you tried the mocha ice bombs? They might be to your liking? I still haven’t mastered the ‘chewy’ texture or a sweet treat without the sugar. I’ll work on it, promise. I agree, I am utterly disappointed. I used unsalted butter, and instead of coco powder- (because I read some people saying it was bitter and salty, I didn’t want to risk wasting my ingredients) so I used sugar free chocolate syrup, hoping that I would not get any stevia bitterness. It was bitter before I even added the vanilla. I’m sorry this didn’t work out. I wish I could understand why it’s so nasty and bitter, the recipe seems simple enough. Thank you for posting this Libby, but it didn’t work for me either. This turned out really salty for me too. Should have used unsalted butter. The Philadelphia cream cheese blocks also have salt in them (at least here in NZ). I am really wary of using much stevia, so I tried to counteract the saltiness by adding more vanilla, and a dash of apple cider vinegar, and adding extra walnuts. It helped to some degree, but I certainly would use unsalted butter if I make this again. I used unsalted sweet cream butter, and sugar free choc syrup, it was still bitter. Sugar Free Chocolate syrup is very bitter on its own, that might be the problem. I tried to make this using Great Value (Walmart) brand Stevia and it was terrible. Salty and bitter. Now I bought Trader Joe’s Organic Stevia Extract. (It was rated the sweetest/tastiest/least bitter in a review of Stevias I read.) Any thoughts on that? I’m nervous to try and it be gross again. I believe it has the potential to be yummy but I’ve now learned stevia is very fickle! I’ll get it right eventually…. I use granulated stevia which measures spoon for spoon instead of sugar. These brands are the ones I use. You may be thinking of the pure stevia which yes would be far too strong. I use liquid and powder stevia from Trader Joe’s for my treats, but mix it with erythritol. People make the mistake of adding more stevia to get more sweet, but it is very quick to lean towards bitter instead. The erythritol helps combat that. 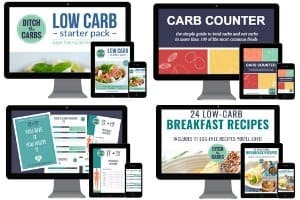 Take a look at this page, Low Carb Starter Kit, it shows you all the brands I use. This recipe is too tasty. I made it a few days ago and it is almost gone. I use the ones on this page. They measure spoon for spoon. Don’t get confused with the concentrated stevia products such as the liquid, in which case, yes this would be far too much. Stevia is usually made up of a majority of artificial sweetener along with the natural Stevia. Check your labels. Try honey or bananas instead. So much nicer and better. Honey and bananas = sugar and both will raise your blood sugars and your insulin. There’s no artificial sweetener in stevia, or in erythritol, or the combination of stevia + erythritol (Truvia), or Swerve (pure erythritol, which is nonGMO, diabetic friendly and doesn’t upset the stomach). You have some bad information. People eat LCHF because they can’t have, or don’t want sugar, as in honey and bananas, which would make our blood sugar high, cause a spike in insulin, as well as cause a stall in weightloss for those trying to lose fat. Also, most people can break their addiction to sugar by eating this way and a little bit of “nicer and better” will trigger a binge knocking them off the wagon. Goodness this is a luxurious treat! I made this earlier today after reading the recipe and taking all the comments into account. I didn’t have nuts but I did have almond paste s I used that. I added some coconut oil to the mix as well. I put everything over hot water to mix it in well. Stuck it in the fridge in the mixing bowl because it had all separated from the heat, waited an hour or so for it all to firm up them gave it a good mix before putting it into my lined pan to set properly. Having licked the spoon, and the bowl, and snuck a tasting or two, I’m thoroughly hooked on this fudge. Gets my two tombs up for simplicity and taste. Lisa you are a star. I absolutely love it and encourage people to adapt my recipes to whatever they have in the cupboard or at hand. I love your idea of the almond paste. Last week my 8 yr old requested peppermint fudge so I omitted the walnuts and just added some peppermint flavouring – well it had him licking the spoon and sneaking a tasting or two also. Libby. Never thought of adding peppermint. That sounds yummy. I will try that next time. Oh my, I made this last night and it is delicious! However, unable to find block cream cheese in the UK, so it didn’t set like fudge, more like cheesecake. So, I wondered – do you have a low-carb recipe for a cheesecake base that I could use this on!? I have heard that from a couple of readers now that the regular full fat cream cheese is hard to find. This is what I use. You can easily use this cheesecake base or any other of the cheesecake recipes I have. You could even add more butter next time, that would guarantee it to set but may change the flavour slightly (more buttery – now that’s a brilliant idea). Libby. Libby, I made this recipe last night with sweet N low. I only used 1 tbs because I thought it might be too much sweetener since I wasn’t using granulated stevia. I also used Hershey special dark chocolate. Maybe it’s just me, but it has a very strong after taste that I find unpleasant. So I added half as much cream cheese and butter and a little more vanilla. It improved slightly. It set perfectly. Still not something I’m going to eat. I lost all taste for sweets and carbs on my LCHF diet, but I did occasionally enjoy a treat. I have a friend dieting with me that still wants treats, so I was really making it for him. Don’t know if he’s being nice or he really likes it, but I don’t think it tastes very good. Any thoughts on whether the sweet N low could be the culprit? I have never used sweet n low, I quickly checked the website and it looks like some contain saccharin. I personally only use stevia or erythritol. See this post to see what I use and what to avoid. I think you are right, I too am thinking it was the sweet n low that caused the after taste. This is very similar to Dr. Sarah Hallberg’s keto fudge. She adds peanut butter to the cream cheese and butter. She doesn’t use walnuts but that is a nice addition too. My husband and daughter like this healthier fudge too. With recipes like this I never feel deprived being on LCHF. Thank You! This is my second favorite recipe of yours! Made it yesterday and had great success. I left my butter and cream cheese out all day. I didn’t melt the butter, but it all creamed together beautifully. I subbed pecans for the walnuts, because thats what I had on hand . I used 3 packets of Truvia, and the sweetness was just right for me. Others said theirs tasted salty- I felt it needed a little salt so I added a little flaked sea salt to the top of each one. I’m keeping them in the freezer for my nightly sweet treats ! Thank you for the lovely review Kelli. My children especially love these (also because they aren’t allowed my brandy truffles when I make them) and these are so quick and easy. I love your idea of storing them in the freezer. You’ve just invented some frozen fat bombs right there. I have made this a few times now with my sweetener and flavours of choice. I use powdered pure stevia from Trader Joe’s that comes with a teeny tiny measuring scoop, and also granulated erythritol. This is a perfect combo for me. I use 12 of the teensy stevia scoops and 1 teaspoon of the erythritol. A note about stevia: It’s not for everybody. Use too much and it will become bitter. Many people make the mistake of tasting stevia and expect the same overpowering sweetness of sugar. When they don’t get it, they add more. This ends up having the opposite effect and results in a product that’s even more bitter and unpalatable. If you try stevia and it’s not sweet enough for you, then do NOT keep adding more! Try a different sweetener like erythritol or sucralose or even the “evil pink”. Personally, I do not like the overpowering sweetness of sugar, so the light touch of stevia is perfect for me. I also add a half teaspoon of peppermint oil so I get a nice refreshing peppermint mocha fudge. I also do not mix the walnuts in. Instead, I carefully place a walnut half on top of where the squares will be cut out. I think the dish I use isn’t tiny enough. A 4×4 rectangle dish will probably be perfect and get that desired depth. Finally, like many others, I have found that melting the butter before adding is sub-optimal and results in a strangely grainy product when first mixed as if the cream cheese is curdling. Just leaving the butter and cream cheese out for a while seems to work better. Yay Lisa. This recipe really seems to be one of those hit and miss recipes for some reason. I’m so glad you loved it. It’s my 8yr old’s favourite. I made it a few times and I love it. It’s hard not to lick the bowl or just eat it with a spoon before it sets! I use unsalted butter because the taste of the salted one was overpowering, but damn it’s a good treat. I tend to make it when I need a quick chocolate fix. Ok, we are diary free, so I used the kite hill almond cream cheese. And also some maple syrup. They have a weird taste. They also are very thin, not thick like yours came out. They are in the freezer now. Am bringing them to my parent’s house to try. Replacing 2 of the ingredients I’m afraid will totally change this recipe. I think it will be the almond cream cheese that is the problem. If they have turned out too thin, you need to use a smaller dish to make sure the fudge sets deeper. I would LOVE have/see, a peppermint mocha latte AND fudge developed for keto. Love love love those ideas. I’ll start thinking about how to create them. Thanks for the ideas. based on previous comments, because of the salty comments, i used unsalted butter, and didn’t melt the butter, but left it and the cream cheese for several hours at room temp so they were both soft. it mixed up beautifully, and the texture ended up being like a soft lovely buttercream. although i used double what usually sweetens the cookie recipe i use with high fiber and low carb, it was piercingly bitter and unpleasant, with a salty undertone that i imagine must come from the terrible bitterness as there was no salt in the fudge at all (from anything, including the nuts). i won’t be making this again. i might try the truffle recipe that uses melted 70% choco instead of powdered cocoa, but this is far too bitter to contemplate again. i would never offer or recommend it to a friend. i am sorry to have to give such a negative review. i loved the consistency if the bitterness could just be overcome. i may try this again using peanut or almond butter and almond extract instead of the cocoa powder. It sounds like the bitterness has come from too much sweetener as there is no bitterness at all from the butter nor the cream cheese. Did you taste the mixture before you kept on adding sweetener? I always advise to add according to taste. To rescue a recipe where you have added too much sweetener. you usually can serve with (slightly) sweetened cream. I never like anything to go to waste. No, it wasn’t that, it was that much unsweetened powdered cocoa. I don’t use stevia as it can get bitter very easily. I use liquid sucralose. That is why i thought i might try it without the cocoa, and use something like almond butter. I do find cooking using weight wonderfully easy. I just made my first batch and they came out fabulous! My tweaks were (due to ingredients on hand) powdered erythritol (~1T, to taste) and one capful of Davinci SF Vanilla syrup in lieu of the Vanilla. Other than that I kept the ingredients the same and my non-keto boyfriend is inhaling them. I’ve been having a hard time finding a good low carb, basic ingredient, chocolate recipe but finally have after many failed attempts (most too bitter). I used light block cream cheese because it has the same carb count (Canada) and pecans because that’s what I had. Cindy that sounds amazing with pecans and great that you were able to find similar ingredients. It’s silly how Philadelphia makes different products for different countries. I’m trying to get hold of them to see what is available and similar to us all. It sounds like the butter was too hot when the cream cheese was added. They can easily split, sometimes I pop the mixture into the fridge for a while to let it all cool down, and completely mix it once again before setting. There’s nothing salty in the ingredients. Maybe you accidentally used too much stevia (who’s bitterness can be confused with salty) or possibly salted walnuts? Please let me know, How many servings does this recipe make? You give the nutrition facts but without the amount of servings I can’t know how much 1 serving is. Can the lower fat cream cheese (Neufchatel) be used in this recipe or any of your other recipes that call for cream cheese? I can’t say for certain as I have never used the low fat cream cheese. I know readers have told me the spreadable cream cheese will not set. Mine also came out with a salty taste. I measured everything perfectly. I can’t tell if it’s the butter, or maybe too much dark cocoa powder. I keep adding the stevia, helps a little. There is nothing that should really be salty in the recipe. Maybe check your walnuts, are they salted? Walnuts are not salted. It has a weird taste at first but the after taste is sweet. Are you using regular cream cheese? Which type of stevia do you use? Yes, the regular block cream cheese. Stevia in the raw. It came in a big green bag. Stevia in the raw? I have never heard of that one. 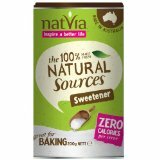 I use Natvia generally which is a blend of stevia and erythritol with no slaty or bitter after taste. Can I use Swerve as the sweetener?? I’m sure you could. I can’t get that here in NZ so I always add “or sweetener of choice”. I followed this to a T- even buying the dark variety of cocoa powder (I thought they were all dark, haha), but as soon as I added the cocoa powder, the butter and cream cheese separated again. I stirred and even whisked it for half an hour and gave up. What could have gone wrong? Generally this happens if the butter is too hot. Just pop the mixture in the bowl back into the fridge to set a little then mix again. Try this a couple of times and it should set fine. Also, ensure you have used regular cream cheese. not the spreadable type – that will never set. Even pop it into the freezer – frozen fat bombs! Yum. Hi Libby, we can’t get hold of block cream cheese in the Uk. Does this mean that we also can’t use for the keto brownies? Sorry maybe I should refrain from using the term ‘block’ of cream cheese as I understand this isn’t available in all countries. As long as you use the standard full fat cream cheese this will work. There have been some failures when readers have tried to make it with low fat or spreadable, both of which have different properties. As long as it is the high fat (not lite or reduced fat) and as long as it is not spreadable, it will set. Hi I was gonna ask the same thing – I’ve not seen blocks of Philadelphia cheese here in the UK. We can only get it in tubs ie spreadable, full fat or low fat. Even the supermarkets own brands come in tubs. So tubbed cream cheese it will have to be. These look amazing. Great and yummy idea using cream cheese to make the fudge. I am making these tomorrow. Thanks for sharing. I have just made this, it’s in the fridge hardening. I used macadamias. I think I’ll cut it into 9 pieces and going on the packaging, each piece should only be 1.6g carb. Only thing is that the natvia (stevia brand) didn’t seem to dissolve so I think it might be a bit gritty. I agree Kirsty, I just made them too, licked the bowl (it’s important to taste everything lol) and I think the Natvia will stay gritty. I am thinking next time I will put it with the butter to melt, might dissolve it a bit? My first time using it to be honest, so don’t know how it might dissolve if at all lol. I want to whip these up tomorrow afternoon, how long does it take for them to set? They will set in a couple of hours in the fridge, not as solid as regular fudge, but set enough to pick up. You can speed it up by putting them in the freezer, in fact many readers are telling me they prefer them this way – a quick frozen dessert. In the fridge setting, I couldn’t quite get my butter and cream cheese to mix together but I see above my butter was probably too melted (and I think my cream cheese not quite enough LOL)….I don’t care they will set down and taste delish I have no doubt! Love your website and recipes! This one looked delicious and easy. Turned out way to salty. Can put in enough stevia to neutralize it (have quadrupled the 2 tblsp) Is the salty flavor coming feom the butter. Though the recipe didn’t call for it, should I have used unsalted butter? Any ideas on how to save thus batch? Thanks for the reply! I used raw unsalted macadamia nuts so I’m sure that’s not the issue. I’m probably mistaking bitterness for saltiness and just need to add more stevia. I know the recipe calls for sweetener to taste, but since I’m already at 8 tblsp I just wasn’t sure about adding more. Is there a point at which too much stevia is unhealthy or defeats the purpose? Saved my fudge with 5 tblsp sugar free rasberry preserves and they are absolutely delicious! Have to keep them in freezer to stay set enough but that just makes them even better! Thanks for everything! Awesome Terry 🙂 I love the idea of the sugar free jam, and yes, many people are saying they keep theirs in the freezer, and are even better that way. Great suggestions. Yum! I’m going to make this soon. Thank you!! Needed a lot of sweetener. 3 T. Is not nearly enough. Also using soft stead of melted butter would make combining cream cheese and butter much easier. Had to beat it a lot. Consistency is like frosting, but will firm up when chilled. Ah ha, that’s why I always say sweetener according to taste. So many readers are on different parts of their sugar free journey, so what is sweet to one, is bitter to another. Try these in the freezer too, they turn into yummy walnut chocolate frozen fat bombs. hi Libby,just wanted to say I just love your recipes ,so easy to make and really delicious. how long will these keep in the fridge and also have you tried freezing them? In the fridge they should last a week, and yes I have frozen them. They turn into the most amazing frozen fat bombs!!! I subscribed to your site after making the peppermint fat bombs (which are awesome). I went looking for a fudge recipe under recipe search and …no results. So what do I find in my inbox this morning. I can’t wait for these guys to set. One question. I had about 3/4oz liquid butter that wouldn’t mix in. All ingredients were measured accurately. I’m so glad I answered your quest for fudge today 🙂 and those peppermint fat bombs are pretty awesome huh? As for the butter which wouldn’t mix in, maybe it was melted too much? If you pop it in the fridge, then wait for it to cool a little, then mix again, it will get mixed in quite easily. They are also amazing frozen! Please provide measurements in spoons and cups also. It’s hard to convert the ingredients amounts and I make quite a few mistakes. Not all of us have scales. I too have difficulty with these measurements. Just Google it. Seriously. I’m in England and use weights and most of the low carb recipes on the net are American so I do it all the time. Just Google e.g. “1 cup water to grams” etc. and you’ll soon get used to the amounts. I do have a set of cups and of course spoons but I can’t honestly see how anyone can get an accurate measurement of hard things like butter, coconut oil and unchopped chocolate so I always convert those to grams anyway. And if you only have cups, it’s just as easy (if less accurate) to convert back again, honest! I completely agree with Libby, a scale is the way to go. If you don’t have a scale, they are very inexpensive (we got ours for $12 or $15 at a TJ Max and it’s worked great, our measuring cups and spoons sets cost a combined $40). With that being said, this turned out very badly for me, which I didn’t think would be possible with the simplicity of the ingredients. I used walmart brand splenda, which I think is the culprit. I had my fiance taste it to make sure that it wasn’t just me (I thought my taste buds could be wacky from the recent, drastic change in diet)… he too thought it tasted … how to describe it… almost chemical. My fiance said he couldn’t put his finger on it but the closest way he could describe it was “almost salty and an odd bitterness”. (He hasn’t seen the recipe or comments). I really think it’s the sweetener. I will try stevia in a very small batch and follow up to let you know if it worked for us.